I’ve wondered if visitors to Craigwell Cottage would take a walk over the Forth Road Bridge, and thought that maybe giving some idea of what to expect might entice some of our visitors to take this thrilling walk.For the last 3 years, my son and I have been making an annual walk over the Forth Road Bridge, checking out the progress on the new Queensferry Crossing which is due to open in 2016. This started as a ruse to get a soon-to-be teenager away from sitting in his room, and the idea was that it would be an exciting walk which offered the possibility of a train trip back, as well as a destination for a good lunch. 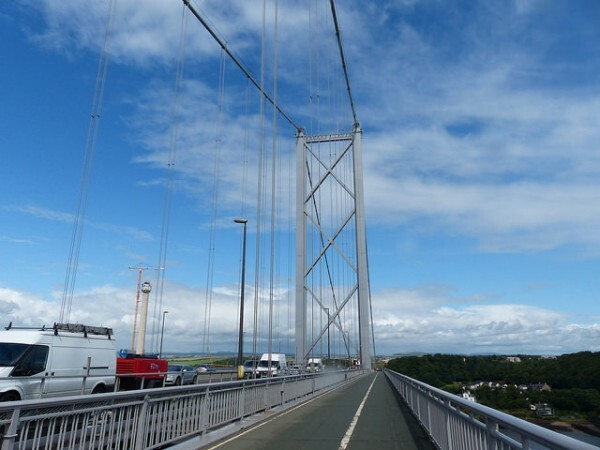 To reach the Forth Road Bridge, visitors staying at Craigwell Cottage can take a train from Waverley Station to Dalmeny Station and then walk down through South Queensferry and up onto the Bridge. The walkway is well sign-posted, and today when we walked, the east-most walkway was open to walkers (with cyclists taking the parallel path). We started the walk with grey skies looming towards the west, and a couple of times we got caught in a brief shower. At one point we were sheltering behind the south tower, and one of the bridge maintenance crew (who were seated in a warm van) shouted over to us to get out there! Easy for him to say. We were just wondering if any of our belongings would blow away on the crossing. By the time we’d passsed the mid point and were heading towards the north tower, it was clearing over Fife and we began to take a few more photographs. A warning though – there’s a steady stream of traffic on the bridge including many heavy lorries, and it is a pretty noisy walk. The bridge, being a suspension bridge, also moves quite a lot, so it can be difficult to get your camera to focus. But there’s plenty to see in every direction – distant views up river towards the Longannet Power Station and Rosyth Shipyard, and down river you can sometimes see as far as Berwick Law on a good day. As we reached the south tower, we saw the second group of love locks on the bridge parapet. 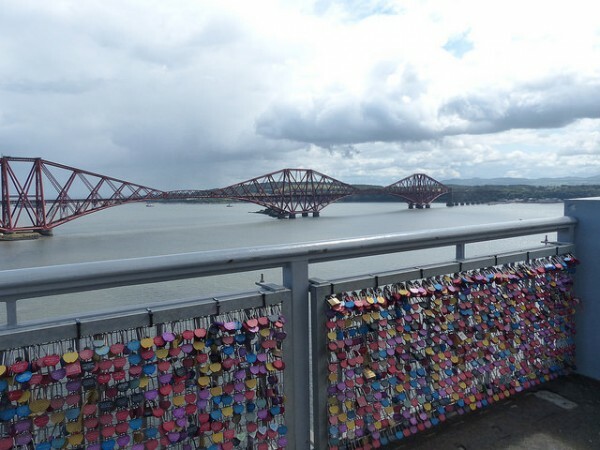 These were sold as a fund-raising campaign on the 50th anniversary of the Forth Road Bridge in 2014, and raised a significant sum for local charities. 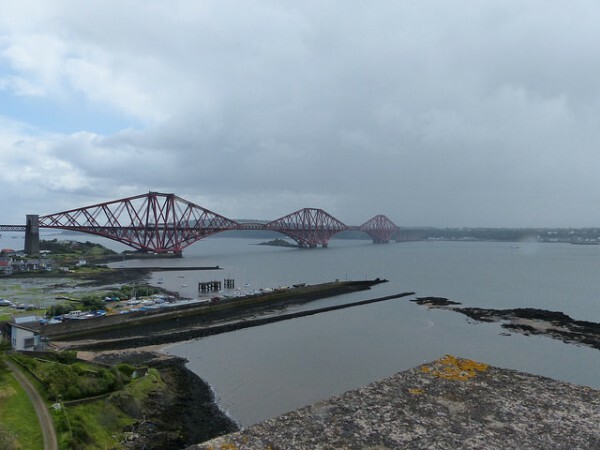 The Forth Bridge (the rail bridge in the above picture) has recently been inscribed with UNESCO World Heritage Status, joining 5 other sites in Scotland with this status. They are: St Kilda, New Lanark, the heart of Neolithic Orkney, The Antonine Wall and the Old and New Towns of Edinburgh. As we reached the northern end of the bridge we turned to see that it was the turn of South Queensferry to be caught in the downpour. 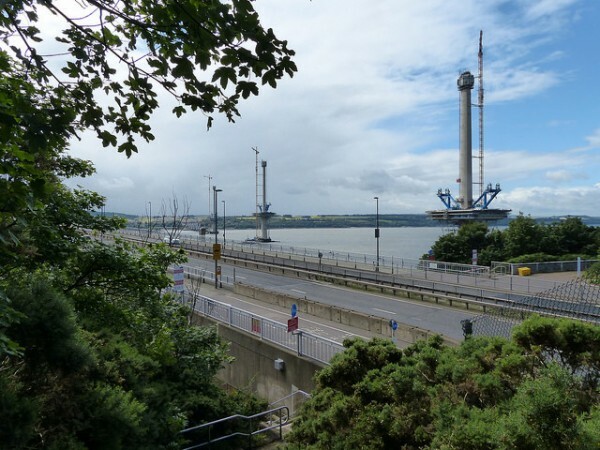 We climbed up the steps at the Fife end of the bridge to take a look at the progress of the Queensferry Crossing. In the photograph you might just be able to see a box-like structure sticking out just above the blue metal work. This is the lift which we watched ferrying materials from base to top of the tower. If you want to watch progress, you can find out more following the links at the end of the article. 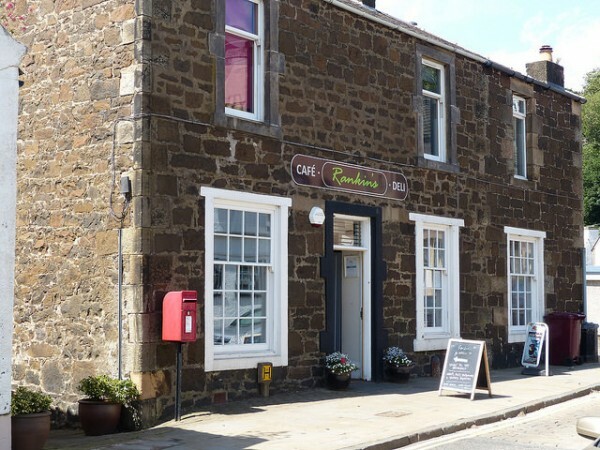 By the time we reached the village of North Queensferry, we’d worked up an appetite for lunch so headed to Rankin’s Cafe and Deli, where, after a short wait, we were able to order a good value lunch and some warm drinks. My companion had been visualising the waffles, bacon and poached egg option since the start of the walk! After lunch, there’s the option of visiting the Aquarium at Deep Sea World, or climbing up to the railway station to catch a train back to Waverley, and a short walk back to Craigwell Cottage. To find out when you can book a short break at Craigwell Cottage, just fill in your arrival dates in the search box near the top right of this page, and we look forward to welcoming you to Edinburgh. Enjoy the Bridge Walk when you’re here! 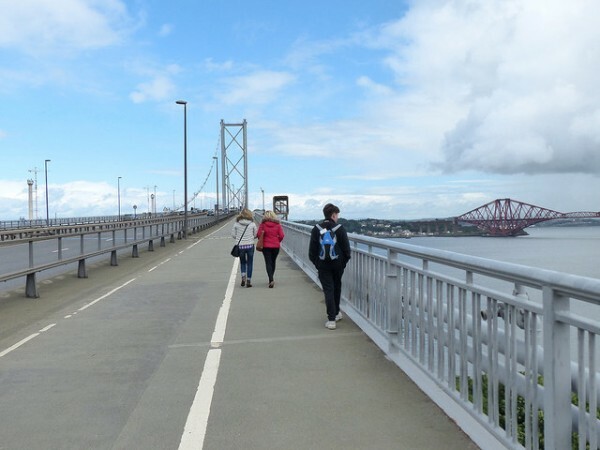 Check train and bus times for access to the Forth Bridge walk using the Traveline Scotland Apps. Rankin’s Deli Facebook Page has information about daily specials and opening hours.